She slumped lazily beside her father in the front-seat. Then they started driving home. 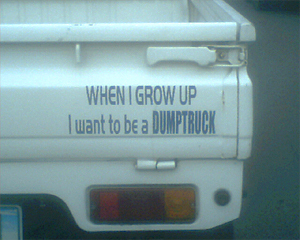 "When I grow up, I want to be a dumptruck." The bumper sticker caught her fancy. She smiled amused. It was and old, worn mini-cab speeding along the highway. And she told herself, "Yeah, why not?"